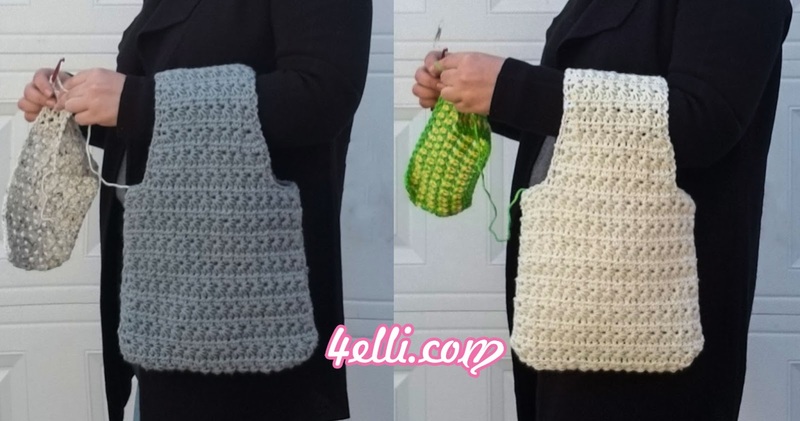 How to crochet my to go yarn bag!! Row 1: [insert the hook into the 3rd chain from hook and pull up a loop (2loops on hook), insert the hook into the next chain and pull up a loop (3loops on hook), insert the hook into the next chain and pull up a loop (4loops on hook), insert the hook into the next chain and pull up a loop (5loops on hook), insert the hook into the next chain and pull up a loop (6loops on hook), yarn over and pull through all 6 loops, chain 1] 1star made, *[insert the hook into the previous star's eye and pull up a loop (2loops on hook), insert the hook into the previous star's side and pull up a loop (3loops on hook), insert the hook into the previous star's last chain and pull up a loop (4loops on hook),insert the hook into the next chain and pull up a loop (5loops on hook), insert the hook into the next chain and pull up a loop (6loops on hook), yarn over and pull through all loops, chain 1]star made*, repeat from * to * across. To finish the row make 1 hdc into the last chain. Row 2: chain 2, turn, *2hdc into the next star's eye*, repeat from* to * across. Finish the row with 1hdc on top of turning chain. Row 3: chain 3, turn, [insert the hook into the 2nd chain and pull up a loop (2loops on hook), insert the hook into the 3rd chain and pull up a loop (3loops on hook), insert the hook into the next stitch and pull up a loop (4loops on hook), insert the hook into the next stitch and pull up a loop (5loops on hook), insert the hook into the next stitch and pull up a loop (6loops on hook), yarn over and pull through all 6 loops, chain 1] star made, *[insert the hook into the previous star's eye and pull up a loop (2loops on hook), insert the hook into the previous star's side and pull up a loop (3loops on hook), insert the hook into the previous star's last chain and pull up a loop (4loops on hook),insert the hook into the next stitch and pull up a loop (5loops on hook), insert the hook into the next stitch and pull up a loop (6loops on hook), yarn over and pull through all loops, chain 1]star made*, repeat from * to * across. To finish the row make 1 hdc on top of turning chain. In the end of row 18 finish your work. Row 19: with a new yarn ball make a slip knot, skip 5 stitches from the beginning ans insert the knot into the 6th stitch. Chain 3, [insert the hook into the 2nd chain and pull up a loop (2loops on hook), insert the hook into the 3rd chain and pull up a loop (3loops on hook), insert the hook into the next stitch and pull up a loop (4loops on hook), insert the hook into the next stitch and pull up a loop (5loops on hook), insert the hook into the next stitch and pull up a loop (6loops on hook), yarn over and pull through all 6 loops, chain 1] star made, *[insert the hook into the previous star's eye and pull up a loop (2loops on hook), insert the hook into the previous star's side and pull up a loop (3loops on hook), insert the hook into the previous star's last chain and pull up a loop (4loops on hook),insert the hook into the next stitch and pull up a loop (5loops on hook), insert the hook into the next stitch and pull up a loop (6loops on hook), yarn over and pull through all loops, chain 1]star made*, repeat from * to * until 6 stitches remain. When you are in the end and 6 stitches remain, 1hdc into the next stitch, 5 stitches remain. Finish the row here and leave the last 5 stitches unworked. Rows 20-30: repeat rows 2 and 3. In the end of row 30 finish off. Join the sides the bottom and the top with sc or sew them together! 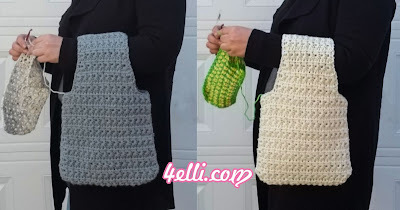 Please watch my free video tutorial witch shows you how to make this beautiful to go yarn bag step by step!! !